NEW DELHI: International fliers can now hop on to Delhi's high-speed Airport Metro Express 'baggageless' with the much-awaited check-in facility for flights abroad at its stations kicking off today on the first anniversary of the corridor. National carrier Air India and private airlines — Jet and Kingfisher — began the check-in facility at New Delhi and Shivaji Stadium stations today, exactly a year after the showcase line opened for the public. While Air India has opened the facility for its flights to five Gulf countries and Nepal, Jet Airways will provide the facility for its flights to Nepal and Kingfisher to Hong Kong initially. Miza Muzaffar, a native of Muzaffarpur in Bihar, was the first to avail the check-in facility at the Air India counter at New Delhi station. "I work in Abu Dhabi and I came to know about this facility. I am happy that this opened. I got my boarding card," he said. The facility allows fliers to check-in their baggage before boarding the Airport Metro Express to reach the new swanky Terminal-3 of the Indira Gandhi International Airport. They will be given the boarding cards at the station itself. The luggage will then be transferred to the train, which has a dedicated space, and directly boarded to the respective aircraft through a conveyor. NEW DELHI: Exactly a year after the Reliance Infrastructure-led Delhi Airport Metro Express became operational, it is offering check-in facilities to international flyers at two of its stations. The facility will be available from February 23 at Shivaji Stadium and New Delhi stations for passengers travelling on Air India flights. This will allow flyers to check in their baggage before boarding the Airport Metro Express to reach Terminal 3 of the Indira Gandhi International Airport. Passengers will be given their boarding passes at the station. The luggage will be transferred to the train, which has a dedicated space, and directly loaded onto the aircraft by a conveyor. "Check-in facility for internationals flights of Jet and Kingfisher will follow soon," said a Reliance spokesperson. NEW DELHI: International fliers can now board Delhi's showcase Airport Metro Express 'baggage-less' from Thursday when the much talked about check-in facility for flights abroad at its stations — New Delhi and Shivaji stadium — will kick off. Passengers have to check-in a minimum of twoand-a-half hours prior to their flight time, the spokeperson said. "Fliers can check-in and collect their boarding passes a maximum of eight hours prior to their flight time." Check-in facility for domestic fliers has been in operation for the past few months on the Airport Metro and the launching of check-in for international fliers has been long overdue. The 23km high-speed corridor that allows passengers to reach IGI from Connaught Place in around 20 minutes currently has a ridership of 20,000 commuters. The spokesperson said talks were on with other airlines that have international service from the IGI Airport, to come and set up check-in counters at the Reliance Metro Airport Express stations . Anil P Gupta, president , R-Infra said the international check-in service at New Delhi and Shivaji Stadium stations will help passengers flying abroad to avoid long queues at the airport. "International fliers can collect their boarding passes at the Airport Express Metro Station itself and go for security check at the airport, totally hassle free," he said. The six-hour check-in period would be beneficial to passengers coming from Uttar Pradesh, Haryana, Punjab and Rajasthan as they can check-in their luggage at the stations and then go for shopping. NEW DELHI: Passengers of the three full cost domestic carriers – Air India, Jet and Kingfisher – may finally be able to check in at the New Delhi metro station by June 1. The civil aviation ministry took a review meeting on Tuesday and said that work on coordinating trials and implementing security apparatus was going on as per schedule. "After our last meeting, work has moved at a fast pace and it seems like Delhi Airport Metro Express (P) Ltd will be ready to start check-in by June 1. A final review will take place on May 30," said a senior ministry official. The metro line became operational on February 23 against the original plan of having it functional before the Commonwealth Games in October 2010. Check-in has also missed several deadlines, the last one set for May 1. Airlines will start their operational readiness and airport transfer trials by Wednesday. Sources said that Air India will be the first to conduct trials while other airlines would join in as and when they had sufficient staff. "Earlier, airlines had raised objection to starting operations without proper trials. On Tuesday, they said they were prepared to start operations from June 1 if trials could begin immediately. DAMPL has been carrying out baggage trials and from Wednesday it will also start passenger trials. If they are not able to manage, check-in might get delayed by another week but as of now it doesn't seem that it would get delayed beyond that," said airport sources. DAMEPL has also agreed to waive off charges for setting up counters but airlines will have to pay up for additional space if they take any. Sources said that no other airline had so far shown any inclination of taking up counters at the stations. "International airlines do not operate enough flights to bother with taking up more counters and the low cost carriers feel it will be too cumbersome for their passengers to arrive at terminal 3 and take a shuttle to terminal 1D. They might join the full cost carriers once the Aerocity station – that is closer to the domestic terminal – opens up," said sources. Bureau of Civil Aviation Security will also clear security-related matters in the next few days. It had set up an internal committee to assess security facilities at the station and will clear the standard operating procedures by next week. Officials also said that in the absence of a mechanical passenger reconciliation process at the terminal, airlines will be responsible for ensuring that passengers who have checked in at the metro station have arrived at the airport in time for their flights. Passengers would be required to report at the boarding gate 30 minutes before scheduled departure. NEW DELHI: Mohammad Kamil , a 42-year-old non-resident Indian returning from Saudi Arabia, is in complete awe of the Metro Express that takes one from the New Delhi railway station to the international airport in just 20 minutes. "I can't differentiate between Saudi Arabia and India right now. The speed, comfort and the time and money I save by using it – it's just fantastic value. With such developments, I feel proud to be an Indian," Kamil told IANS. As more and more people get to use the new Metro line, they are loving the ambience, the speed, and its super efficiency. 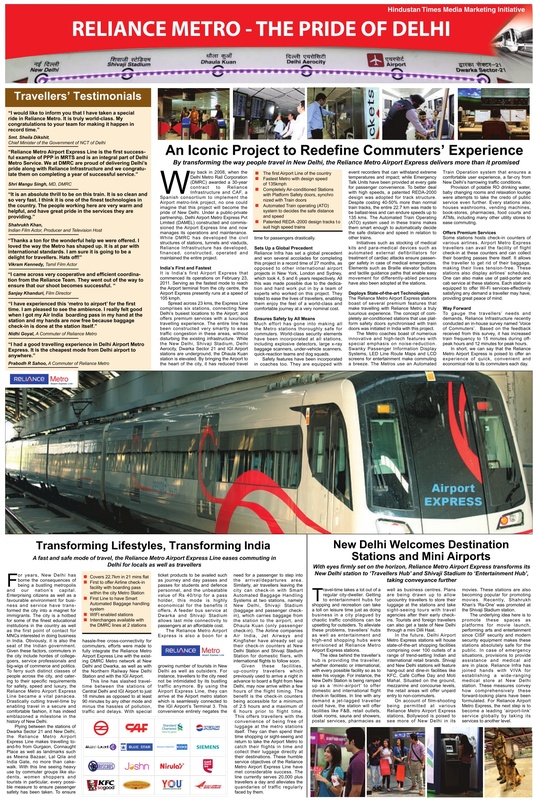 Proud residents say the Delhi Airport Metro Express will play a pivotal role in transforming Delhi into a world class city. According to officials of the Delhi Airport Metro Express Pvt Ltd (DAMEPL), around 7,000 travellers are using the service on a daily basis. The airport express line commenced operations Feb 23 and is Delhi Metro's first public-private partnership project. Delhi Metro is responsible for the civil work and Reliance Infrastructure will operate the line for 30 years and share the revenues. The 20-km journey takes 20 minutes and LCD screens display flight information inside the train coaches. The distance otherwise takes over an hour to cover by road. "I took the Metro from the New Delhi railway station and it should have taken 20 minutes to reach here, but the journey was completed in just 19 minutes," said an amazed Nazir Iqbal, who had come to drop his sister at the airport. According to Sharad Sahni, the new Metro line is a wonderful alternative to other modes of transport like taxis and uncomfortable auto-rickshaws. "You have the luxury to travel air-conditioned at half the price of other public transport and minus the jams, heat and smoke," said the second-time traveller. "The speed at which it is travelling – I read it is 105 km per hour – you get the feel of an aircraft and with the superb amenities at the stations, our air journey begins the minute we enter the Metro station!" Sahni added. However, some travellers opined that the tickets could have been cheaper and direct baggage check-in from the station should be introduced as soon as possible. Officials say this will be possible in a few months. The travel from the New Delhi railway station to the airport costs Rs.80 and the full journey up to Dwarka Sector-21 costs Rs.100. "The prices could be slashed a bit once the footfall increases," said Rakesh Bhoj , a businessman from Gujarat who visits the capital twice a month. "I am travelling for the first time after reading about it in the newspapers and I must say I am very impressed," Bhoj told IANS. "At present, this line is just perfect and I hope they don't spoil it by introducing the 'women reservation' coaches here too," Bhoj quipped. A Reliance Infrastructure official said direct baggage check-in was likely to begin next week. According to DAMEPL officials, the numbers are expected to grow further once the direct baggage check-in and the Dhaula Kuan and Delhi Aero city stations are opened soon. With a combination of elevated, at-grade and underground lines in its 190 km network, the Delhi Metro has revolutionised the way people travel in congested Delhi since 2002. An economical, comfortable and efficient mode of travel, the Metro is used by 1.5 million people everyday. The city is much better connected within and also to neighbouring sub-urban towns like Noida and Gurgaon, with more places to be connected soon. NEW DELHI: Seconds after the clock struck 2pm, the first Airport Metro train streamed out of the New Delhi Railway Station. Excited passengers broke into applause, thrilled to be part of the historic first ride that brought IGI Airport within blinking distance of the city centre. About 10 minutes later, the train emerged from the ground into the Delhi Ridge, drawing oohs and aahs from commuters who had probably never seen the city so green. The train travelled well above the tree tops, making several of Delhi's landmarks, including the Rashtrapati Bhavan, clearly visible. Four months behind schedule, the airport line nonetheless opened to heart warming reception on Wednesday. About 2,000 people travelled from the New Delhi railway station to Dwarka Sector-21 between 2pm and 8pm. The first passengers at each station, many of them joyriders, were presented with a bouquet, a gift and a receipt for their tokens. It was a smooth ride, barring a few initial hiccups. "I entered the station at 1.25pm and happened to be the first passenger to purchase a token," said Obaid Ahmad Khan, a retired government official. "I came only to enjoy the first Metro ride and inaugurate the train. It was a wonderful experience." no baggage trolleys were in sight at any station. New Delhi, Feb 24 (PTI) Delhi Metro''s Airport Express Corridor, which takes passengers from Connaught Place to the International Airport in 18 minutes, is slowly becoming popular among Delhiites with over 6,000 people travelling on it today. From 6 AM to 8 PM, over 6,000 people travelled on the 23 km high-speed link which was opened to the public yesterday. Yesterday, over 3,000 people had taken the line with majority of them being fliers. Passengers can travel to IGI Airport from New Delhi at a cost of Rs 80 in 18 minutes with one stop in between initially. Currently, the corridor has a 16-hour run from 6 AM to 10 PM, which is likely to go up to 20 hours soon. Check-in facility at stations are expected to begin next month. A hassle-free and swift ride to the Indira Gandhi International Airport became a reality on Wednesday when the Delhi Metro’s showcase Airport Express Corridor finally rolled out for the public after several missed deadlines. Two high-speed brand new trains began their journey from two terminating stations — New Delhi and Dwarka Sec-21 — at 2 p.m. without any formal inauguration or much fanfare. Initially, the Line will have a 16-hour run from 6 AM to 10 PM which is likely to be increased to 20 hours soon. Delhi Airport Metro Express Private Limited (DAMEPL), the Reliance Infra-led consortium that will operate the line, is planning to hold a formal inauguration ceremony sometime in March. Decks were cleared for opening the Line after the Central Industrial Security Force (CISF), which will guard the line, completed its deployment and conducted mandatory operations yesterday. Built at a cost Rs 5,700 crore, the Airport Metro Express, the first corridor in the country to come up on Public-Private-Partnership model, promises a smooth ride for Delhiites in a plush environment from Connaught Place to Dwarka Sec-21 via the new swanky Terminal-3 of the IGI Airport in flat 18 minutes as compared to over 45 minutes to 60 minutes by road. In a bid to attract commuters, the DAMEPL will offer tickets at a much cheaper rate initially. Commuters can reach IGI Airport from New Delhi by paying Rs 80 and regular commuters can avail monthly passes facility provided by the concessionaire. Five to six trains will be pressed into service from today on the line and they will run at a frequency of 20 minutes. The frequency may be increased based on the popularity and rush. Trains on the Line are completely different from the existing Metro coaches and have been procured from CAF Spain, the firm which supplied trains to Heathrow and Hong Kong Metro Express Lines. Every coach has several LCD screens and the trains are narrower than the Metro trains that are currently plying in the capital. Passengers will be able to check the flight status at all stations on the Airport Metro Line and will have comfortable seating arrangements on the train. Trains on the high-speed corridor will initially run at a speed of 105 km per hour and it will be increased to 120 km per hour after due clearance from Research, Designs and Standard Organisation (RDSO). Four stations — New Delhi, Shivaji Stadium, IGI Airport and Dwarka Sec-21 — will become operational, but two other stations — Dhaula Kuan and Delhi Aero City — will open later. Though the line opened for public today, the check-in facility, one of the salient features of the corridor, will not be available for commuters immediately as talks with airlines are still on. The check-in facility at three stations — New Delhi, Shivaji Stadium and Dhaula Kuan — is expected to be available when the formal inauguration takes place. With this, Delhi joined a few world cities like London, Hong Kong, Seoul and Kuala Lumpur to have a high-speed link connecting the city with the International Airport. DAMEPL claims the line was completed in record 27 months time. The Line, which was the first Metro corridor in the country to fail a safety test, missed at least three deadlines — October 3, October 31 and December 31 — set by the Delhi Metro Rail Corporation and the Union Urban Development Ministry. Though Commissioner of Metro Rail Safety R K Kardam gave his go—ahead for the line after his second inspection in January, the line could not be opened because of uncertainty over who will man the line. While the Centre and Delhi Metro wanted the CISF to man the corridor like any other line in the capital, the DAMEPL wanted its own men to take over the security. After much deliberation, the Home Minister had on February four handed over the security to CISF. This will also be the first line in the country to be mapped on Geographic Information System to enhance safety, maintenance and traffic regulation. Mapping the corridor on GIS will help in mobilising emergency services in case of a blast or fire on the train. The company has mapped all the emergency services, including fire stations, police stations, hospitals etc along the alignment. NEW DELHI: Delhi Metro's showcase Airport Express Line , which promises to take passengers from the city's shopping hub Connaught Place to Indira Gandhi International Airport in 20 minutes, will begin its commercial operations from Wednesday. The 23-km high-speed link on which trains will initially run at a speed of 105km per hour will open nearly five months after it missed its original deadline of 2010 Commonwealth Games. "The line will begin its commercial operations on Wednesday", a Delhi Metro source said. CISF spokesperson Rohit Katiyar said the force will conduct anti-sabotage operations on the Airport Express corridor tomorrow. "The deployment of CISF personnel on the Line is on. Anti-sabotage operations will be done on the line tomorrow and on February 23 morning, the CISF will be ready for operations," the source said. However, a formal inauguration of the high-speed link, the first Metro corridor in the country to come up on the Public-Private-Partnership mode, is likely to take place later. The line will begin operations on Wednesday with four operational stations – New Delhi, Shivaji Stadium, IGI Airport and Dwarka Sec-21. Other two stations – Dhaula Kuan and Delhi Aero City – are expected to be ready by the time the formal inauguration takes place, the sources said. With this, Delhi will join a few world cities like London, Hong Kong, Seoul and Kuala Lumpur to have a high-speed link connecting the city with the International Airport. The Delhi Airport Line was completed in record 27 months time. When the commercial operations start on Wednesday, passengers will not be able to check-in their baggage at the stations as talks with Air India and other private airlines are still on. Sources said the facility will be available by the time the formal inauguration takes place possibly in March. New Delhi:The Capital will join a select few cities in the world to have a high-speed link to the airport with Delhi Metro's most sensitive line likely to start commercial operations from Wednesday, finally bringing the IGI airport closer to the city. If all goes well and CISF completes its deployment process by tomorrow, the 23-km Airport Metro Express that connects the city's shopping hub of Connaught Place with the new swanky Terminal-3 of the Indira Gandhi International Airport will be opened to the public on Wednesday. However, a formal inauguration of the high-speed link, the first Metro corridor in the country to come up on the Public-Private-Partnership mode, is likely to take place later with sources indicating that high-profile dignitaries will be invited for the function. Both Delhi Airport Metro Express Private Limited (DAMEPL)– the Reliance Infra-led consortium that will run the corridor– and Delhi Metro Rail Corporation (DMRC) said they are hopeful that the Line will be begin operations on Wednesday with four operational stations – New Delhi, Shivaji Stadium, IGI Airport and Dwarka Sec-21. "We are hopeful that the Line will be operational from February 23. The CISF deployment is likely to be over anytime now. So in all probability the commercial operations will begin on Wednesday," a DMRC source said. Other two stations — Dhaula Kuan and Delhi Aero City — are expected to be ready by the time the formal inauguration takes place, the sources said. With this, Delhi will join world cities like London, Hong Kong, Seoul and Kuala Lumpur to have a high-speed link connecting the city with the International Airport. The Delhi Airport Line was completed in a record 27 months' time. Sources in the CISF said the deployment of its forces on the high-speed corridor has been fast-tracked and it is likely to be over in a day or two. "We usually take two to three weeks to complete our deployment. So, it should be over in a day or two," the sources said. Sources said the facility will be available by the time the formal inauguration takes place, possibly in March. Missing the deadline seems to have become the fate of the Airport Express Line. The service that had already missed several deadlines including that of Commonwealth Games, is again likely to miss another deadline. Sources in the ministry of home affairs indicated that the line cannot be thrown open for public before March. However, last Saturday, Lalit Jalan, CEO and director of Reliance Infrastructure Ltd, had promised that the line will be thrown open latest by February 20 and not after that, come what may. "We are going to open the line latest by February 15-20 in any case," Jalan had said. However, when contacted on Thursday, CISF spokesperson, Rohit Katiyar told HT: "The deployment of CISF personnel at airport metro will be done in two-three weeks time. This much time is required for creating of infrastructural facilities and administrative support system required for force personnel." "We will need two to three days time after CISF completes deployment. We are waiting for CISF to confirm their deployment date and we have also requested them to advise us a suitable date to start the passenger service," said a DAMEPL spokesperson. Delhi Airport Metro Express Pvt Ltd (DAMEPL) is the subsidiary of Reliance Infrastructure, the concessionaire company. Sources said that CISF would deploy around 250 men to the core security areas in the 23 km network. These include access control, frisking, baggage checking — manually and through x-ray scanners, quick reaction teams, armed support and bomb detection and disposal squad. CISF will take security personnel from three sources-men deployed in Delhi Metro network, Delhi airport and also a section from reserved battalion-to provide security in the 23 km Airport Express Line. Meanwhile, DAMEPL failing to get core security task for its men, has planned to put them in different other areas including areas of soft security. Some of them will be assigned duties like station management, while some would be deployed at depots, parking areas and for commuters' assistance. DAMEPL had earlier hired 60 veterans from several government security agencies including SPG, NSG, CRPF, BSF among others anticipating that the whole security arrangements would be made by them. When the high-speed Airport Metro Express Line is thrown open to the public by mid-February, commuters will be able to reach IGI Airport from New Delhi station in 18 minutes flat, with only one stop at Shivaji Stadium.The trains will run at a speed of 105 kmph. Even when the other two stations — Dhaula Kuan and Aerocity — are completed and ready for operations, the ride might still take only as much time as the speed of trains will then be increased to 120 kmph. Running partly through tunnels and an elevated section along the Dhaula Kuan station, the line — with its high-speed trains and spacious stations — will be a completely new experience for commuters. Unlike the existing Metro stations, tracks on this corridor are blocked from the platforms with glass doors that will open only when the train arrives at the platform. Even the seating arrangement is different from regular Metro trains, with a narrower aisle flanked by two seats on either side. Information display boards show the time and stations covered on the line, along with a passenger address system that announces the names of stations on the route. Chief Minister Sheila Dikshit, who inspected the line along with senior officials of the Delhi Metro and Transport Minister Arvinder Singh Lovely on Saturday, expressed hope that the line would be thrown open to the public soon. Due to the inordinate delays in completing the work and getting the mandatory clearances, two of the six stations on the line — Dhaula Kuan and Aerocity — will not open to the public when operations begin this month. A formal function marking the inauguration of the line will be held later in March, when all the stations are ready. Having received all the mandatory clearances, the only thing holding up the line now is the deployment of CISF personnel, who will man the corridor. Though the line will open with a 16-hour schedule from 6 am to 10 pm, it is expected to be extended in due time. “To begin with, the line will have a 16-hour service from 6 am to 10 pm and some airlines are likely to set up their check-in counters before the operations start. The issue is being sorted out. A decision will be taken on this after the Civil Aviation Ministry holds discussions with the airlines,” said E Sreedharan, Managing Director, DMRC. After missing three deadlines, Delhi Metro’s showcase Airport Express Line will finally roll out for passenger service in the next ten days, fulfilling Delhiites’ dream of enjoying a fast and hassle-free ride to the International Airport. Though the Airport Express Corridor, that connects the city’s main shopping hub of Connaught Place with the Airport, will have a formal inauguration later, the line will start commercial operations once the CISF guards move in. The good news is that once the line opens, passengers of few airlines may be able to check-in their baggages at New Delhi and Shivaji Stadium stations. A day after the Centre formally announced that the security of the Line will be handled by the CISF, Delhi Chief Minister Sheila Dikshit inspected the corridor and expressed satisfaction over the operational preparedness. “The Line is ready (for operations). It is very good, modern and the only corridor in the country connects the city with airport. It has been built very beautifully,” she told reporters. A senior official of the Delhi Airport Metro Express Private Limited (DAMEPL) said the line is likely to be made operational between February 15 and February 20. The Line promises a quick ride for passengers from CP to Airport in just 20 minutes with 3 stoppages in between. Infrastructure at the stations are ready and the train will run at a speed of 105 km per hour. Ms. Dikshit and Delhi Metro chief E Sreedharan announced that the Line will start operations in a week’s time though a formal launch would happen later. “The formal opening of the Line will take a month’s time, but the trials (operations) will start within a week’s time,” she said. Mr. Sreedharan said the corridor will be thrown open to the public once the security personnel moves in, which is likely to happen in a week’s time. Mangu Singh, Director (Works), DMRC told PTI that the operations will begin in sometime and a formal launch as desired by the concessionaire will happen in a month’s time. “Once the security personnel move in, the Line will be opened for public. Since the concessionaire wants a formal launch we will have one later,” he said. To begin with, the Line will have a 16-hour service from 6 AM to 10 PM and some airlines are likely to set up their check-in counters before the operations start, he said. The link has missed three deadlines – October 3 (Commonwealth Games), October 31 and December 31 – set by the Delhi Metro Rail Corporation and the Union Urban Development Ministry. Built at cost of Rs 5,700 crore, the line will open with four stations — New Delhi, Shivaji Stadium, IGI Airport and Dwarka Sec—21. Two other stations — Dhaula Kuan and Aerocity — may open a little later. Downplaying the delays, Ms. Dikshit said they cannot be avoided if perfection is needed. “If perfection is needed, delays will be there. If the corridor is done in a very hasty manner then there is a risk. Now the line has been completed it will be formally inaugurated in a month’s time. But the trials will begin soon,” she said. Mr. Sreedharan said the Public-Private Partnership model is “eminently suitable” for lines like the Delhi Airport corridor. “PPP model is suitable for these lines not for usual corridors. The Airport Line will be used by people who can pay more and also they can fix the price up to Rs 150. So it is eminently suitable,” he said. About the reluctance of airlines to set up check-in counters at the city airport terminals, Mr. Sreedharan said the issue is being sorted out by the Civil Aviation Ministry. “The issue is being sorted out. The Civil Aviation Ministry will be holding discussions with the Airlines and a decision will be taken soon,” he said. About increasing the speed of trains on the Line, Mr. Sreedharan said trial runs at the promised speed of 120 km per hour will begin next week and the speed will eventually be increased once the Research, Design and Standards Organisation (RDSO). Initially, trains on the line will run at a speed of 105 km per hour as against the promised speed of 120 kmph due to restrictions imposed by CMRS. The corridor had failed the first safety test in September 2010 and missed its Commonwealth Games deadline. Trains on the line will be different from the normal Metro trains and have been procured from CAF, Spain which also supplied trains to Hong Kong airport metro and London’s Heathrow Express. The Airport Express Line is the first metro line in the country to come up on PPP model. After creating civil structures, the DMRC has handed over the line over to Reliance Infrastructure which will run the high-speed corridor for 30 years. The company will map all the emergency services, including fire stations, police stations and hospitals along the alignment. NEW DELHI: There's some light at the end of the tunnel for the Airport Express Metro line. On Friday, the contentious issue of security on the line was finally resolved after the intervention of the ministry of home affairs (MHA). Sources said a compromise formula was brokered by the ministry, which made it clear that the role of the CISF as the security provider on the line was non-negotiable. However, it accepted the concessionaire's argument that the number of personnel requested by CISF was on the "high side", and that a smaller contingent would be deployed on the line. With the security issue cleared up, the opening date of the Airport Express Metro is expected to be announced shortly. The line will be inspected by the Delhi CM, Sheila Dikshit, on Saturday. A spokesperson for the Delhi Airport Metro Express Pvt Ltd (DAMEPL) said, "According to the MHA, the course security for the Airport Express line will be taken care of by CISF." Sources, however, say that the compromise formula doesn't mean that DAMEPL would not be deploying its security at any point along the Metro. Said an official, "While the course (line and tracks) security will be under the CISF, along with the emergency services, the inter-face in the stations, etc will be handled by DAMEPL's own security set-up." Incidentally, the opening date is yet to be decided. Sources present in the meeting confirmed that the date of deployment of the CISF personnel would take another week. Said an official, "The CISF was unable to commit to a date for deployment of personnelâ€¦this is expected to take some time, around a week to 10 days." Sources said that the concessionaire and the CISF would meet again to decide on the date of deployment, after which, the line would be thrown open to the public. Officials from DAMEPL, however, tried to play down the additional time required to start the line, claiming CISF had been asked to deploy their men "soon". The Airport Express Metro line has been delayed by several months. It was supposed to have opened in time for the Commonwealth Games in September last year but got delayed as neither the stations nor the line was ready. The concessionaire has since been slapped with a fine for over-shooting the deadline. Officials now hope that the line will become operational by mid-February. following a physical inspection by the Research, Design and Standards Organisation (RDSO). The 23-km line will be opened once clearance is received from RDSO for running trains at a higher speed — 120 km per hour — as promised earlier. "Inspection by RDSO is expected to take place any time this week and we are hopeful that the speed of trains will be increased to 120 km per hour," said a Delhi Airport Metro Express Pvt Ltd (DAMEPL) spokesperson. He added that the inspection process would possibly be over in a day and the line will be thrown open immediately. Mangu Singh, director (works), Delhi Metro Rail Corporation (DMRC), said: "The RDSO inspection is expected this week; we do not have any date for the same." According to DMRC officials, the line, which has already missed its deadline four months ago, should be opened immediately after security arrangements are made by the CISF in association with private security guards hired by DAMEPL. "Speed restriction should not be considered a factor. The line should be opened even without RDSO's speed certification and the process can continue even after the inauguration," said Singh. The delay has cost DAMEPL dear. The concessionaire company had already paid R34.5 crore as fine to DMRC for failing to open the line on time, said Singh. "If they delay further, the fine amount will keep increasing," he said. Meanwhile, ministry of home affairs, after verifying the security audit report, has recently issued a letter asking CISF and DAMEPL's security guards to make the necessary security arrangements, DMRC officials said. New Delhi: The fate of Delhi Metro's most sensitive link between Connaught Place and the airport may be decided this week when the Home Ministry is likely to convene a meeting of officials from CISF and the concessionaire to break the stalemate over the security issue. The meeting is likely to be held on Thursday or Friday at the instance of the Delhi Metro Rail Corporation (DMRC), whose representatives may also be invited for the meeting, sources said. The meeting comes 23 days after the Commissioner of Metro Rail Safety (CMRS) gave his nod for the high-speed link that promises to cover the 23-km distance in flat 18 minutes. Home Ministry's decision to convey a meeting of officials from CISF and Reliance Infrastructure-led consortium comes a week after the DMRC wrote to it seeking its intervention on the issue. While the Government and Delhi Metro are keen on deploying CISF on the corridor like other metro lines in the capital, the Reliance Infrastructure-led consortium wanted its own security personnel to guard it. Delhi Metro had last week said that the line will be guarded by CISF, but modalities are yet to be worked out between the security agency and the Delhi Airport Metro Express Line Limited. CISF and the DAMEPL have been holding discussions on the number of people to be deployed by the CISF and private security guards by the concessionaire. The last meeting was held on Tuesday. The DMRC had asked the Home Ministry to intervene and expedite the matter. Initially, trains on the Line will run at a speed of 105 kms per hour as against the promised speed of 120 km per hour due to restrictions imposed by the CMRS. However, the speed will be increased soon after its receives the nod from Research, Design and Standards Organisation (RDSO). The corridor had failed the first safety test in September 2010 and missed its Commonwealth Games deadline. During the earlier inspection, Kardam had problems with speed trials of the trains. The link that connects the city's shopping hub of Connaught Place with the Indira Gandhi International Airport has missed three deadlines — October 3 (Commonwealth Games), October 31 and December 31 — set by the Delhi Metro Rail Corporation and the Union Urban Development Ministry. DMRC officials said the line may start with a 16-hour run initially from 6 AM to 10 PM and be gradually increased. The consortium says it is ready to run even for 20 hours a day. The line will open with four stations – New Delhi, Shivaji Stadium, IGI Airport and Dwarka Sec-21. Two other stations — Dhaula Kuan and Aerocity — may open a little later. The delay over the opening of 23-km Delhi Metro Airport Express Line is going to be over with the intervention of the Union Home Ministry. The Express Line, which has already missed many deadlines, is likely to be opened, at least partially, within a week. Ministry of Home Affairs (MHA) is likelyto hold a tripartite meeting with the Central Industrial Security Force (CISF) and the concessionaire company, Delhi Airport Metro Express Pvt Ltd (DAMEPL) within a couple of days to clear the logjam over long-pending security issues, said MHA sources. “About 10 days ago, the MHA had issued an order, asking the CISF to make necessary security arrangements in association with the private security guards of DAMEPL. Both the parties are holding talks to work out modalities. Once the security matter is resolved the line will be thrown open for public immediately,” said Mangu Singh, director (works), Delhi Metro Rail Corporation. “This is a welcome move. We have been requesting the government to call a meeting with all concerned parties at the earliest,” said a DAMEPL spokesperson. Sources said the line will be opened immediately after settlement of security issues. It is now over three weeks since the DAMEPL got a safety nod from the Commissioner of Metro Rail Safety RK Kardam. But despite promises made earlier by the DAMEPL to open the line immediately after receiving the CMRS nod, it failed to kickstart the service so far mainly due to issues related to security. New Delhi: The Airport Metro Express Line has taken another step towards its public opening as the long-standing decision on the security arrangement for the line has finally been taken. Like all other Metro corridors, this line too will have the Central Industrial Security Force (CISF) manning the stations. The CISF conducted a security audit and submitted its report on Monday, following which the Ministry of Home Affairs has decided that the security will be handled by the CISF, along with private security guards engaged by the Delhi Airport Metro Express Private Limited, the concessionaire running the line. “Though the audit has been done, the report is now being discussed by Reliance Infrastructure and the CISF. The number of personnel from the CISF and private security to be engaged on the line is being finalised,” Mangu Singh, Director (Works), DMRC, told Newsline. Sources said the process is expected to take another week or 10 days, after which the line will be opened to public. Running way behind schedule, the line has already missed its Commonwealth Games deadline. New Delhi, Jan 18 (IANS) Delhi Metro's high-speed Airport Express Line (AEL) is expected to begin operations by next week, Delhi Metro chief E. Sreedharan said Tuesday. The Commissioner of Metro Rail Safety (CMRS) has given the go-ahead to the Airport Express Metro line (AEL), but there are still some issues of security to be resolved. 'I expect everything will be in position and we will be able to open the line within a week's time… Basic thing is security, it should be taken care of,' Sreedharan told IANS in an exclusive interview. The operation of the line has been delayed, as the concessionaire for the line, Delhi Airport Metro Express Pvt Ltd (DAMEPL), is insisting on keeping the security in-house while the government wants the Central Industrial Security Force (CISF) to handle it. 'The only thing delaying the operations of AEL is the security. The government of India has said that the security should be with CISF, but the private party all along has been going on the basis that they want their own security arrangement,' the 78-year-old DMRC chief said. He said that DAMEPL, a Reliance Infrastructure-led consortium, is trying to get the 'CISF on board'. 'The moment they are able to get the CISF mobilised for the security, we can open. Within a week's time we hope it will be organised,' added Sreedharan. He also said that initially the Airport Metro Line speed will be 105 kmph. DMRC is in the process of obtaining an approval from the railway ministry-run Research, Design and Standards Organisation (RDSO) on increasing the speed. However, Sreedharan said an increase in speed to 120 kmph will not make much of a difference. 'At 120 kmph, from New Delhi Railway Station to IGI airport it will take 18 minutes, and if it is 105 kmph it will take 19 minutes – only a minute's difference,' he said. The 23-km link will connect the central shopping district of Connaught Place with the Indira Gandhi International (IGI) Airport. The line has six stations — New Delhi Railway Station, Shivaji Stadium, Dhaula Kuan, Delhi Aero City, Indira Gandhi International (IGI) Airport and Dwarka Sec-21. But, ultimately, DAMEPL will take a call on the issue. 'I don't know what is in their mind. They want to start the line first and they can have an inauguration later, as when you start a new line it will take time to stabilise,' Sreedharan added. 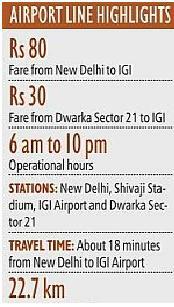 NEW DELHI: The commute to IGI Airport is all set to become cheap. Even as Delhi Airport Metro Express Pvt Ltd waits to launch the airport express Metro line, it has come out with the fare structure. A single journey from New Delhi Metro station to IGI will cost you Rs 80. If you're setting out from Dwarka sector 21, you would pay just Rs 30 . There's, however, a caveat. These are 'inaugural' fares, with the cheapest ticket being Rs 20, DAMEPL officials said. While it's anybody's guess how long the inaugural fare will last — the concessionaire refused to comment –- it's apparent the fares been fixed with an eye on catching the maximum ridership. The fare increases at an increment of Rs 20 as you travel through the six stations, with the maximum being Rs 100 from New Delhi to Dwarka sector 21. Said a DAMEPL spokesperson, "We will offer our commuters an inaugural fare that`s significantly lower than what we are authorized to charge." The concessionaire also announced a monthly fare structure, which frequent fliers and regular commuters on the line can avail. These are on offer in the form of monthly passes starting at Rs 300 and going up to Rs 1,500. The number of journeys have been capped at 60 in a month. The monthly fare between IGIA and Dwarka is only Rs 450. As per the agreement with DMRC, the concessionaire has a cap of Rs 150 (single fare) that can be charged. Company sources maintained that a fare hike would be announced only after a few months. "There are no plans to review the discounted prices in the immediate future," a source said. The concessionaire is yet to announce when the airport line will be opened. According to officials, the nod from the ministry of home affairs is still awaited, though company sources said that the security issue has been resolved and negotiations are "at an advanced stage" with private airlines for check-in facilities at Metro stations though Air India is already on board. When the line does start, the service is expected to start with 4-6 trains at a frequency of 15-20 minutes, said sources. The frequency will ultimately be raised to 5 minutes once ridership picks up. "We have bought eight trains in the first phase, more will be added later," added the source. NEW DELHI: The much-awaited Airport Express Metro line finally got safety clearance from the commissioner of Metro rail safety on Monday evening. While the line is expected to become operational in around a week's time, CMRS R K Kardam has recommended cutting down the speed of the trains and reconsidering the security set-up. "A few observations have been made, which I hope DMRC will address soon," Kardam said. These include reducing speed from 120kmph that Delhi Airport Metro Express has been proposing to 105kmph and reviewing the use of private security on the line. While the concessionaire has proposed using private security , there have been reservations about the proposal, especially as CISF provides security in the rest of the Metro network. Airport Express Metro Line was given safety clearance on Monday evening and the commissioner has made recommendations regarding the speed of trains and the security setup . "DMRC is already looking into the matter …I have asked it to approach the competent authority ," said CMRS R KKardam. Though DAMEPL officials refused to commit on when the link will be opened , sources said that with the line ready for use, services could become available within three-four days . Said a DAMEPL spokesperson , "We are yet to receive a formal letter from them (CMRS ). Once we have that , a decision would be taken on an operation timetable ." The concessionaire also refused to reveal the fare chart , claiming that a final decision was "yet to be taken" . Sources however , admitted that the concessionaire was hoping to keep it within the cap of Rs 150, the maximum fare for travel from New Delhi to IGIA or Dwarka sector 21. Said a DAMEPL official , "The fare will be commuter friendly …we would like to keep it less than the proposed Rs 150." The base fare meanwhile , will not "vary too much from DMRC rates ," added the official . Sources however , say that the base fare will be substantially higher than DMRC's Rs 8, at around Rs 25-30. The Airport Express Metro line will have six stations : New Delhi, Shivaji stadium , Dhaula Kuan , Delhi Aerocity or NH8, IGI Airport and Dwarka sector 21. Dhaula Kuan and the NH8 stations , however , are not going to be opened any time soon . Said an official , "S ince there's little development along the NH8, we don't expect too many passengers from this station . Fire clearance however , has been taken for the station while the Dhaula Kuan station is still undergoing some civil work ." Passengers can avail of the check-in facility at three stations – New Delhi, Shivaji and Dhaula Kuan . The first two will also do baggage check-in . However , with only Air India at present on board , check-in at the Metro stations is still being sorted out by DAMEPL. The 22km line will be traversed in minutes with the new Metro line , especially with two stations being out of commission at the moment . For passengers , the USP of the Airport Metro is the drop-down points at the New Delhi metro station as well as the multi-level parking that would be available later . The ride from the New Delhi metro station , located adjacent to the Ajmeri Gate side of the New Delhi Railway station , to the IGI airport will be completed in around 20 minutes at a speed of 105kmph . While the checked-in baggage will be sent via a separate channel , passengers will travel through a lounge to enter T3 of the IGI airport . The trains will be climate-controlled and will have specialized front facing seats as well as ample space for luggage. NEW DELHI: Delhi Metro's high-speed Airport Express Line underwent a second safety check Friday and the corridor is expected to begin operations by next week, said an official of Reliance Infrastructure, which has built the network. "The commissioner in charge of Metro rail safety has started a two-day inspection of the corridor. We hope we get the safety clearance certificate tomorrow. Once it is obtained, we will need less than a week to open the line for public," the official said Friday. "In all probability, the line should start next week." 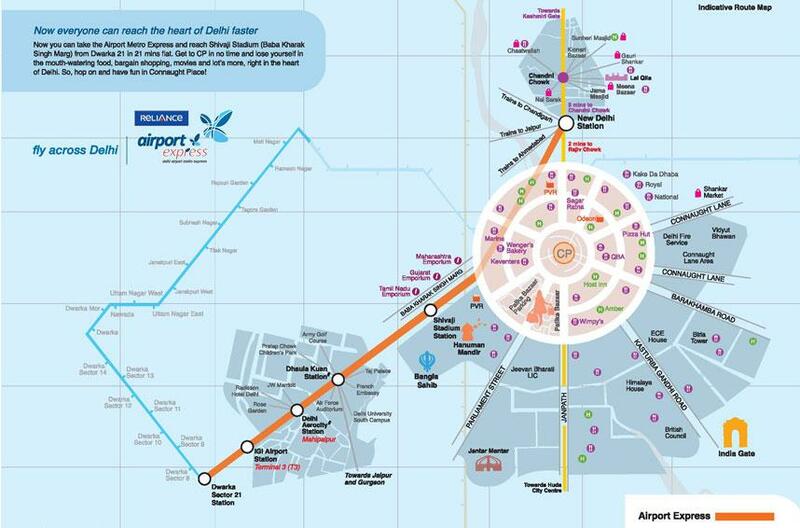 The 23-km link will connect the central shopping district of Connaught Place with the Indira Gandhi International ( IGI )) Airport. It promises to take commuters from New Delhi Railway Station to the airport in 18 minutes. The line has six stations — New Delhi Railway Station, Shivaji Stadium, Dhaula Kuan, Delhi Aero City, Indira Gandhi International (IGI) Airport and Dwarka Sec-21. The idea was also for setting up check-in facilities of airlines at the Metro stations. The Reliance official said an Air India team recently conducted a technical inspection at the stations and was happy with the facilities. The flag carrier is likely to sign an agreement to set up its check-in counters soon, the official added. "Air India has already given us a verbal assurance. We are also negotiating with other airlines for their check-in counters." NEW DELHI: As a new year's gift to passengers, the airport Metro services may finally be started in the first week of January. In a meeting held between the directorate general of civil aviation (DGCA), the civil aviation ministry, Delhi Airport Metro Express (P) Ltd (DAMEPL ) and airlines on Tuesday , Metro also reportedly conceded to starting operations without check-in services though negotiations for commercial operations would be started by the end of this month. According to sources, a committee has been formed to look into the commercial aspect of operations and is expected to submit a report to the ministry by December 29. "Based on what the report suggests, DIAL, DAMEPL and airlines can take a call and negotiate on terms and conditions ,'' said an official. Airlines and DAMEPL have been embroiled in a long-standing argument over the high charges for taking up check-in counters at the Metro stations . Sources have said that a flat charge of $8 per passenger was being asked for from airlines that checked-in passengers at various stations, other than miscellaneous costs like those for the common user terminal equipment that would be provided to each airline. However, airlines were of the view that the charges were too high and they were unwilling to pool together finances and extra manpower for the same. Metro, meanwhile, had not been keen to start operations without check-in facilities. Recently, Air India had shown interest in taking up counters though officials had clarified that the national carrier would not be able to pay the charges Metro had been asking for. The security inspection of the line is also expected to take place just before Christmas. An official said that the Commissioner of Metro Rail Safety (CMRS) inspection had reportedly been scheduled for December 24 and services could commence within two days of getting the approval. The CMRS inspector will also be asked to expedite the inspection so that there are no further delays in starting the line. However, officials will wait for two reports, one on commercial operations and another on security protocol, both to be submitted by December 29, before the line is made operational. The security protocol report will evaluate baggage security once check-in takes place at the Metro stations. "Airlines will not take in baggage if check-in at stations happen before check-in starts at the airport. In that case, we need to figure out who will be responsible for the baggage, where it will be stored, etc. These points, along with the commercial aspect, will be worked out once the reports are in. We are keen to start operations as soon as possible so if these details are not finalized within a week, the line will still start,'' said a senior ministry official. Having missed all deadlines set by the Delhi Metro and by Urban Development Minister S Jaipal Reddy, the Reliance Infra-led Airport Metro Express Line continues to get finishing touches for an opening that no longer has a targeted date of completion. While work at the stations is still going on, paperwork to apply for the mandatory safety clearance is yet to be moved. Reddy, in a written reply to the Rajya Sabha on November 11, had stated the line will be commissioned by November end or the first week of December. The 22.7-km showcase link received a fire clearance on November 30, after which the line was personally inspected by Delhi Metro Rail Corporation (DMRC) Managing Director E Sreedharan on December 8. Sreedharan had ‘expressed satisfaction over the operational preparedness of this line’ and had announced that the documents to invite the Commissioner for Metro Rail Safety (CMRS) for an inspection should be sent across. The CMRS told Newsline that the application is yet to be received, while Reliance Infrastructure and the DMRC maintained that all documents have been forwarded to the CMRS, inviting him for the inspection. “The application for the CMRS inspection has been sent. As soon as the inspection takes place and the approval is received, the line will become operational,” said a spokesperson of the Delhi Airport Metro Express Private Limited, the line’s concessionaire. Work at the six stations on the line, meanwhile, proceeds at a slow pace with furniture for passenger seating yet to be put up. When Newsline visited the stations, workers were found finishing electrical work, including fixing of elevators and escalators. Dwarka Sector 21, the changeover station linking Delhi Metro’s Blue Line with the link, is almost ready, with AFC gates fixed, flooring work over and the platform nearly complete. Finishing touches are being given to the escalators and token counters . The IGI Airport, New Delhi and Shivaji Stadium stations are nearly complete as well. Some electrical work is pending, apart from fixing of escalators and elevators. Passenger information system display boards too have been put up and are being tested. Work at the Dhaula Kuan and Aerocity stations has, however, been inordinately delayed. The station buildings are still under construction, though tile-work on the station’s exterior has begun at Dhaula Kuan. Inside, civil work is pending in large portions of the area. The way to the platform, and the station entrance, are not even half-done. The stations are set to miss the line’s inauguration, whenever that happens. After the corridor missed the Games deadline, the DMRC slapped a fine of Rs 37.5 lakh per day from September 31, which was doubled October 15 onwards. Sources said the DMRC has already withdrawn approximately Rs 20 crore from the operator’s bank guarantee as part of the penalty. The line was denied a safety clearance by CMRS after a two-day inspection on September 27 and 28.